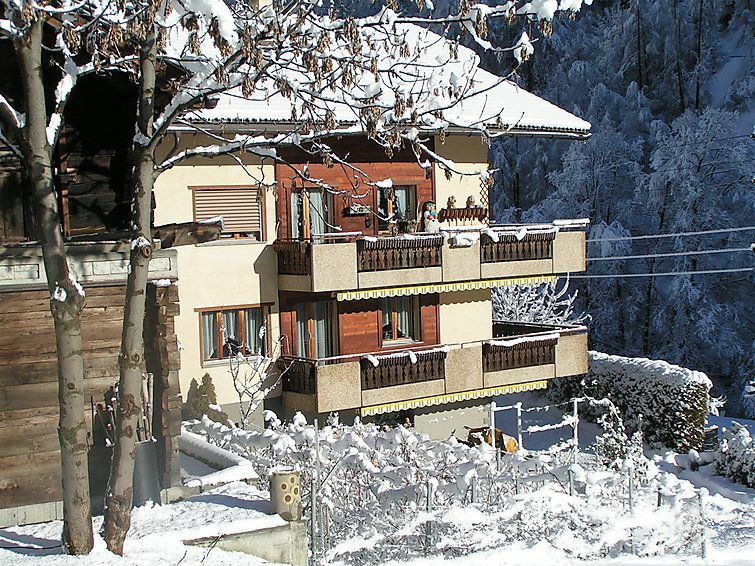 Kalpetran 5 km from Stalden: Beautiful 3-family house "this property". On the outskirts, in a quiet, sunny position. For shared use: lawn for sunbathing. Barbecue. Motor access to the house. Parking at the house. Shop 4.5 km, restaurant 4.5 km, bus stop, railway station 300 m. Tennis 200 m, cable car 400 m, ice field 300 m. Please note: There are more similar properties for rent in this same residence. Playground 200 m. Use of the tennis court and the skating rink on request. 2-room apartment 65 m2 on 2nd floor. Beautiful furnishings: large living/dining room with satellite TV, radio, CD-player and DVD. Exit to the balcony, north facing position. 1 double bedroom with sloping ceilings with 2 beds. Open kitchen (4 hot plates, oven, dishwasher, microwave) with dining table. Shower/WC. Balcony. Terrace furniture. Very beautiful view of the mountains. Facilities: Internet (DSL/LAN, free). Maximum 1 pet/ dog allowed. Inside the apartment there is a small flight of stairs that leads to 2 small rooms with sloping ceilings, which are suitable for 2 children.